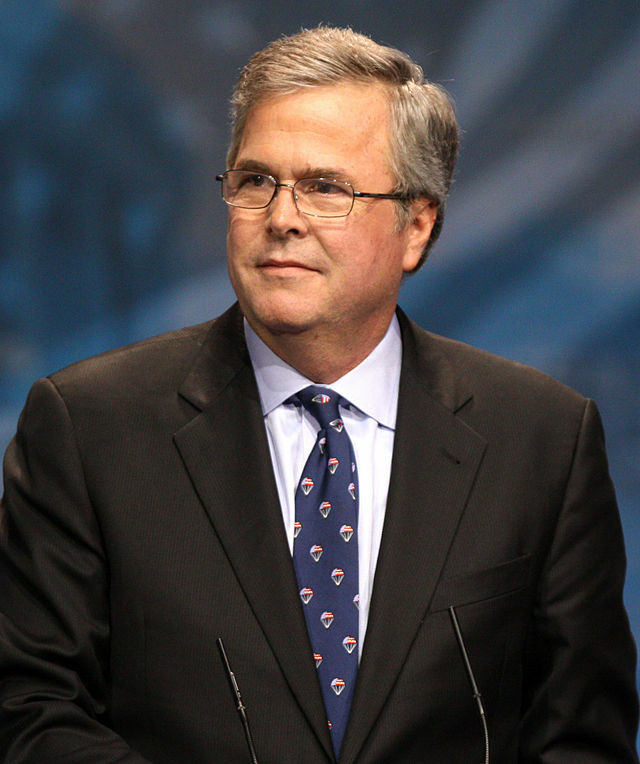 The New York Times reports that former Governor Jeb Bush (R-FL) has taken the first decisive step toward running for president in the upcoming 2016 election. Bush created something called a “leadership PAC” that actively explores the possibility of running for president. It is tantamount in all but name to an Exploratory Committee, and few — if any — serious observers contend that there is a realistic chance he would not follow through and run at this time. Bush, the brother of former President George W. Bush and son of former President George H.W. Bush, is largely seen as the continuation of a quintessential Republican establishment dynasty. While the family may have been, in some circles, considered on the rightward periphery of the party in 2000, times have markedly changed since that time. Specifically, since the advent of the Tea Party, Bush has been lambasted by the base of his own party as insufficiently conservative on immigration-related issues. Earlier this year, he even suggested unauthorized border crossings were an “act of love,” drawing the ire of the right-wing. Bilingual and the husband of a Mexican-immigration (additionally the father of Land Commissioner-elect George P. Bush), Bush is seen as a uniquely formidable Republican opponent for Democratic presidential contenders, namely former Secretary of State Hillary Clinton. Prompted by Bush, a few other names have clamored to reiterate their longstanding almost-campaigns. The serious politicians who belong in that category include Senator Ted Cruz (R-TX), Senator Rand Paul (R-KY), Governor Rick Perry (R-TX), Senator Marco Rubio (R-FL) and Governor Scott Walker (R-WI), among other less glamorous options. Last month, I prognosticated that Cruz has the best chance of the pack to be nominated, and I reiterate that comment again tonight. Make no mistake, the ultra-conservatives (Tea Party) are in firmer control of the party now than they were four years ago. They have only been enraged over the years as their preferred candidates have been cast aside in favor of comparable-pragmatists, such as John McCain and Mitt Romney, who then fell in the general election. Bush — or Governor Chris Christie (R-NJ), for that matter — will be shunned because he will be seen as a continuation of the “play it safe” strategy. Of course, the success of a presidential candidate has little to do with ideology, because the American public does not care enough to understand said ideology. They care about the charisma and soundbites of the messenger. That is why Ronald Reagan beat Jimmy Carter in a way that Gerald Ford likely would not have, even though Reagan was significantly more conservative. Much in the same respect, Cruz is a phenomenal messenger in a way that none of the other candidates are. Not since Joseph McCarthy have the Republicans had a national figure so comfortable with making things up and completely disregarding the truth without so much as a modicum of shame. The only difference is that the media is so impotent and feckless nowadays that there is no Edward R. Murrow to call him out. Cruz is confident, assured and smart, so the base in his party goes along for the ride, even though I think it is fairly obvious he would sell them out in an instant to further his own interest. When the time comes, I believe, the general public will similarly fall for him. If the Tea Party is looking for a knight in shining armor, they will be sorely disappointed just about any way. Cruz may be appealing, quoting Cicero and all. But in the end, his most rapid supporters will just be muttering “Et Tu, Theodore?” At least Bush puts his cards on the table. This entry was tagged 2016 Election, Chris Christie, Edward R. Murrow, Gerald Ford, Hillary Clinton, Immigration Reform, Jeb Bush, Jimmy Carter, John McCain, Joseph McCarthy, Marco Rubio, Mitt Romney, Rand Paul, Rick Perry, Ronald Reagan, Scott Walker, Ted Cruz. Bookmark the permalink.